Written by Kim on May 31, 2015. Bell Rock and Courthouse Butte. I’ve been lucky enough to see a lot of amazing places in my young life. From the snow-covered Alps in Switzerland to the Na Pali Coast of Hawaii, I’ve been to many moving places. But there was something about the colors of the desert—the way those red rocks stretched into the sky—that spoke to my soul. The more I travel, the more I try to live in the moment and to appreciate my surroundings. I couldn’t help but stare in awe at the enormity of the rocks that dotted every landscape, in every direction, for as far as the eye could see. It started with the drive into Sedona. Driving down State Route 89A was like becoming one with some beautiful painting. It was probably the most distracted I have ever been behind the wheel. I couldn’t stop saying, “Oh, wow!” as I stared off in every direction. Over the next three days, I became completely and utterly enchanted with the colors of the desert. I couldn’t take enough pictures of the same rocks, and I couldn’t manage to sit and stare quite long enough to soak it all in. I was so sad to leave this desert oasis to move on to other Arizona sites, that when presented with the opportunity to return on our drive back, we cancelled our reservations in Flagstaff (after checking into our hotel!) and leapt at the opportunity to spend another 24 hours in Sedona. 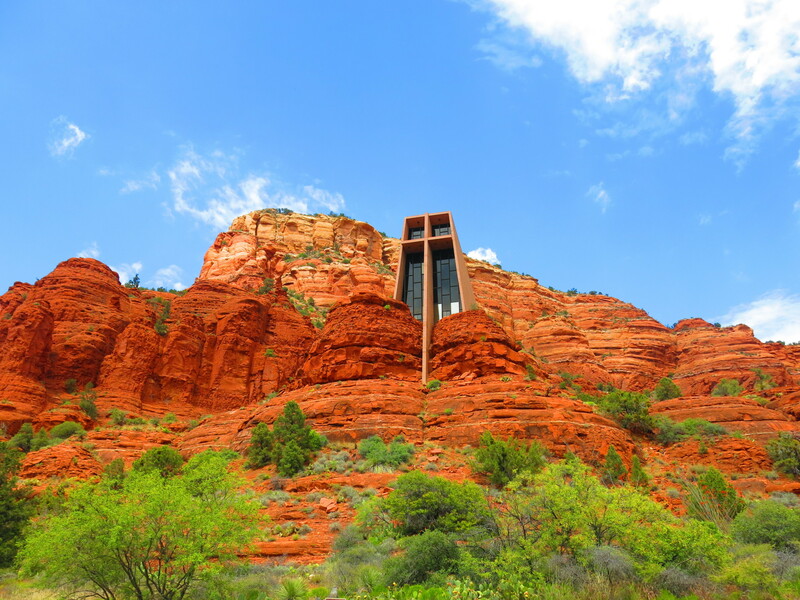 Chapel of the Holy Cross, inspired by Frank Lloyd Wright. 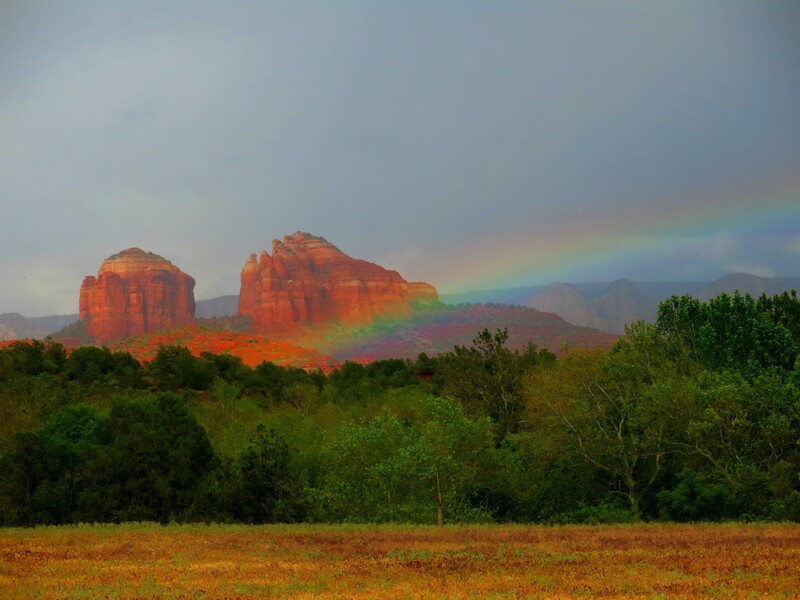 Here’s our guide to one of the most beautiful cities in the U.S.: Sedona, Arizona. Pink Jeep Tours: Do NOT go to Sedona without taking a ride on the Pink Jeep! For more than 50 years, this company has been giving people access to some of the most beautiful off-the-beaten-path spots in Sedona. Take the famous 2-hour Broken Arrow Tour for some stunning scenery, and an off-roading adventure anyone from the casual traveler to the adrenaline junkie will love. ($95 per person; other tours available). Red Rock State Park: With 286 acres to explore, and lots of daily activities, this place is a must-stop on any Sedona adventure. Check with a ranger to help determine the best trail for you to follow, given time constraints and desired activity level. They’re great, and will help you pick the perfect trail for your visit. Storm over Red Rock State Park. 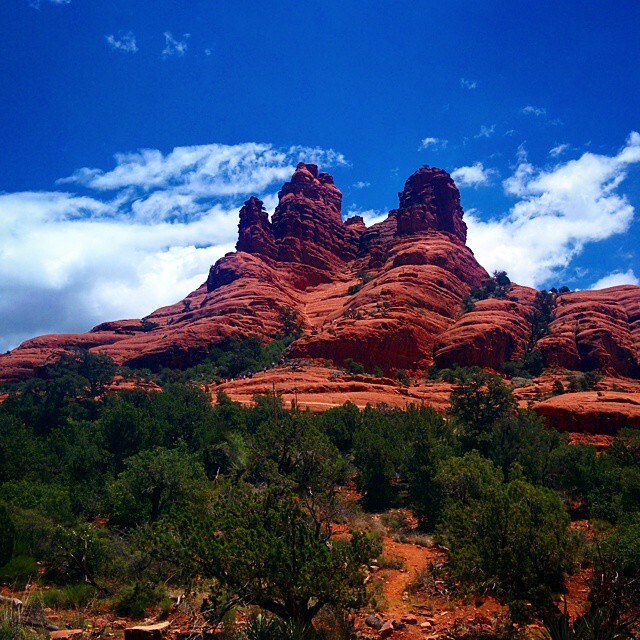 Take a Hike: There are more than 1,000 miles of hiking trails in Sedona. It’s just what you do when you’re there. I’m not a huge fan of hiking, but even I had fun on a handful of trails: Yavapai Vista Trail, Bell Rock Pathway, Airport Loop, and Soldier Pass Trail. There are no bad views in Sedona. What’s great about all these trails is that you don’t have to wait for your reward until the end. All of our hikes took twice as long as they probably should have, since I had to stop every couple of minutes to take more pictures of the dramatic, ever-changing landscape. Make sure to look up info on trails before you go out—some are marked better than others, so it’s good to do a little research before starting your hike. $$$ Hyatt Pinon Pointe: This was a beautiful resort hotel in the middle of downtown Sedona. It was very conveniently located, which made it easy to park your car and walk to the shops and restaurants. We stayed for three nights, and enjoyed using the pool and hot tubs—which had incredible views of the mountains. We liked staying here, but be prepared to get the spiel about listening to a timeshare presentation. $$ The Orchards Inn of Sedona: We spent our last night in Sedona at this hotel—and we wish we’d spent all of our time here! They were having a 40% off deal, and we got a King Suite with INSANE views of the red rocks for $130. The room came complete with a balcony and a fireplace. There is a complimentary breakfast at the Mexican restaurant across the parking lot—something hard to come by at Sedona hotels. This place, too, is located in the heart of downtown. $$$$ Enchantment Resort: We didn’t stay here, but we talked with a lot of people who were staying at the resort when we went to eat dinner there. Everyone was thoroughly impressed—and why wouldn’t they be?! This place is tucked away, back in the midst of towering red rocks. Located about 20 minutes from downtown, this is an isolated paradise—a prime place for relaxation and some serious stargazing. With lots of restaurants, amenities, and a full-service spa, if you want to be pampered, there’s no better place to stay in Sedona! We were impressed by the very chill vibe this place exuded—unlike the ritzy L’Auberge de Sedona. $$$ Elote Café: Serving “creative, out-of-the-box Mexican cuisine,” this place is insanely popular—and insanely good. Go early! It opens at 5 p.m. (Tuesday through Saturday) but people start lining up at 4:30 p.m. By the time we got there at 6 p.m., there was an hour and 45 minute wait! We stuck it out, and OMG, are we glad we did! Whatever you do, order their namesake appetizer: fire-roasted corn with spicy mayo, lime and cotija cheese. Everything is so delicious, you’ll want to buy the cookbook just so you can have it all again. We did! 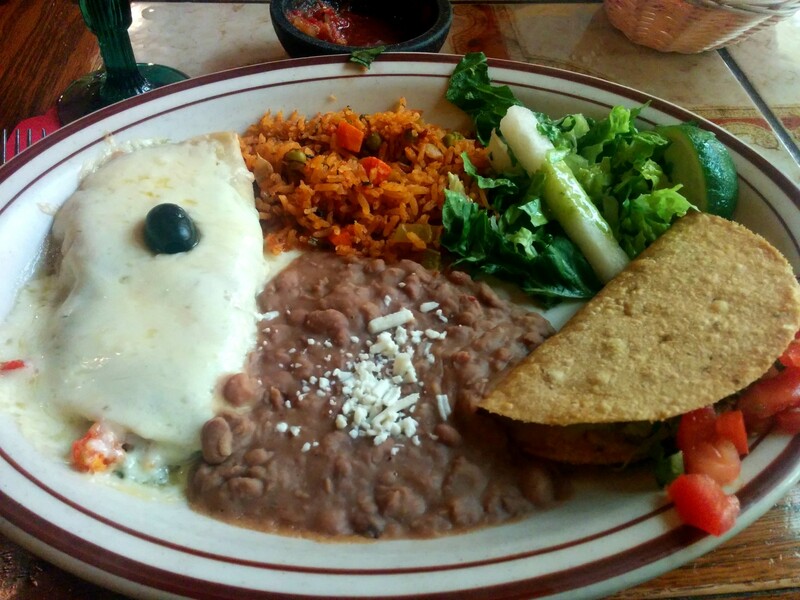 $$ El Ricon: Located in the Tlaquepaque shopping center, this restaurant serves “Arizona-style” Mexican cuisine. While most of the food was mediocre at best, they served the best beans and rice I’ve ever had at a Mexican restaurant! Oh—and try a prickly pear margarita, but beware they’re a little on the liberal side with the tequila! Whew! $$ Cowboy Club & Silver Saddle Room: The Cowboy Club is one of the oldest eateries in Sedona, and played host to the likes of John Wayne and other movie stars who filmed in the area, and is credited as the birthplace of the Cowboy Artists of America. If you want to try some desert cuisine, this is the place to do it. From cactus fries and buffalo chili to—yes—diamondback rattlesnake, you can try so many things you thought you’d never want to see on a plate. $$$$ L’Auberge de Sedona: I had high hopes for this place. It’s rated extremely high on TripAdvisor, and appears to be one of the most beautiful spots in all of Sedona. With outdoor dining by Oak Creek, who wouldn’t want to sit outside and listen to the babble of the brook while you dine on gourmet dishes?! I think circumstance had a lot to do with us not loving this place. It’s attached to a very expensive resort, so the clientele has lots of money, and doesn’t mind flaunting it. That always leaves us a bit cold. Spurts of rain kept us inside, and although I’d looked at the menu online, I didn’t realize it was pre fixe, starting at $80 per person. We weren’t that hungry, so we had to sit at the bar, and order off a different menu (although you can select one entrée from the fancy menu to share, if you’d like). Much like the atmosphere, the food was pretentious, and apparently when you’re banished from the dining room, the service goes downhill rapidly. We enjoyed our prickly pear mocktails and got out of there. The grounds really are beautiful, but if you want to go, just know you’ll be paying a pretty penny for the experience. $$-$$$$ Enchantment Resort: Unlike L’Auberge de Sedona, this place didn’t make us feel like outsiders. 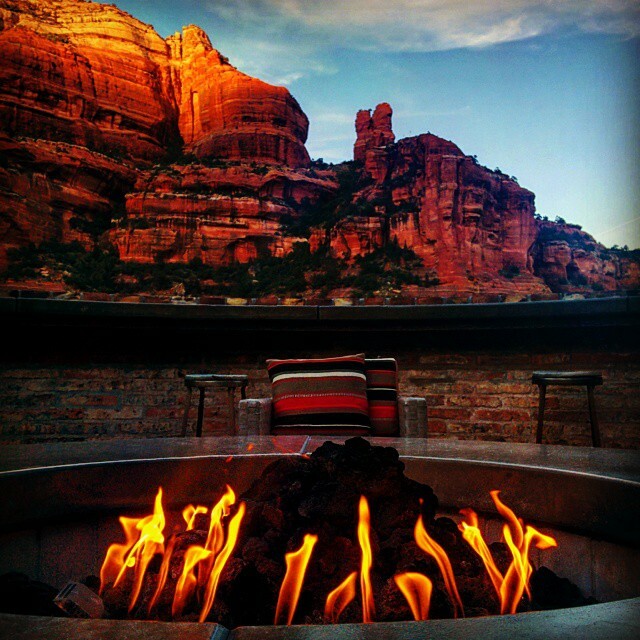 On our last night in Sedona, we decided to go have appetizers and drinks fireside—in the midst of the gorgeous scenery I’d seen online. We ate at Tii Gavo, one of a few restaurants open to people not staying at the resort. We ordered—you guessed it—prickly pear margaritas, and Kobe beef sliders, which were awesome! We spent a fantastic evening talking travel with new friends we made sitting around the fire. Several of us broke out our Google Sky Map app, and started pointing out constellations and planets. 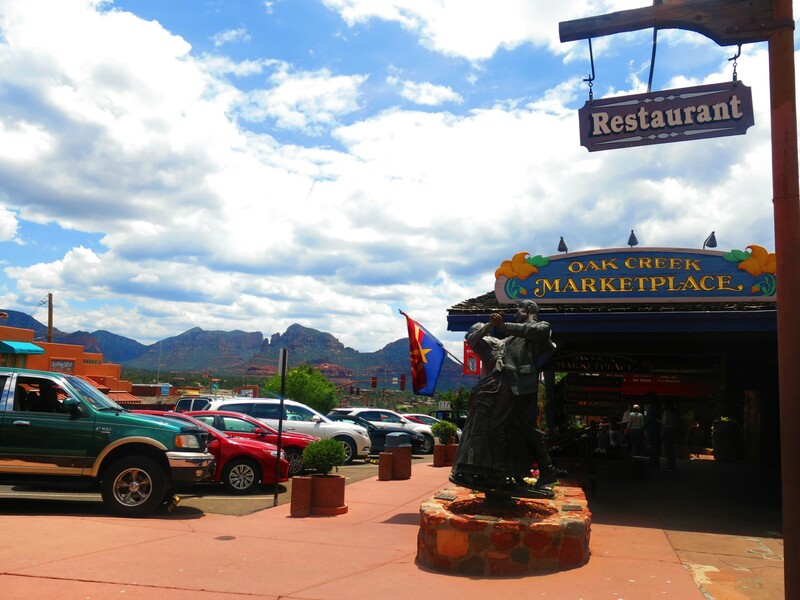 Uptown Sedona: Whether you want fine art or a Sedona sweatshirt, you’ll find it in this shopping center at the intersection of Arizona 89A and 179. Both hotels we used were very close to this spot, and we spent a handful of hours walking up and down the charming blocks. Make sure to take a break from all that window shopping to try some prickly pear ice cream at Black Cow Café, and the to-die-for chocolates at the Sedona Fudge Company—don’t worry, you can’t miss it. The tantalizing scents wafting through the door will entice you inside! 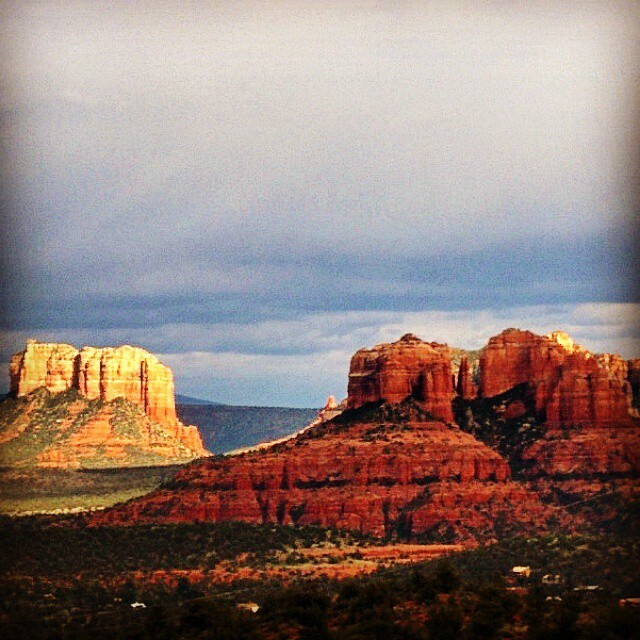 Have you ever been to Sedona? What would you add to our lists?